One person is injured and another in custody after a house fire in Downtown Fresno on Sunday afternoon. 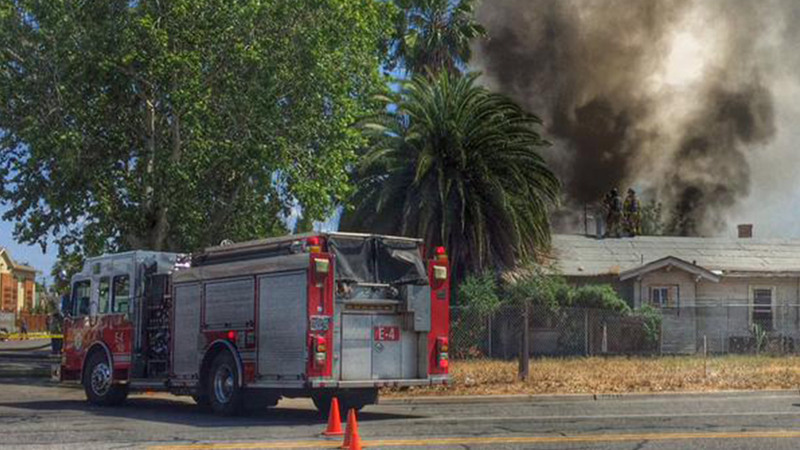 FRESNO, Calif. (KFSN) -- One person is injured and another in custody after a house fire in Downtown Fresno on Sunday afternoon. The suspected arson fire started around 1 p.m. at an abandoned home on F Street near Ventura Avenue. The first crew arrived within minutes to see flames shooting out of the roof. But instead of launching an aggressive battle, they decided to let it burn and focus on protecting surrounding structures. "What happens with these boarded up structures is we get people to break into them, they set a fire, and now there's hardly anything to board up, and the whole back of this thing was already burned up before it started today. So you've got this structure that's exposed with no way to secure it, and it just causes more fires after fires after fires," said Battalion Chief Don Bier of the Fresno Fire Department. Officials say one civilian was taken to the hospital with unknown injuries from the fire. Fresno police also responded to the scene and arrested a woman who witnesses say started the fire. Firefighters battled a house fire in Downtown Fresno on Sunday, April 26, 2015.